I took a master composter class this weekend in Penticton in the hopes of gaining a better insight into the basics of composing. Our winery generates around 100 tonnes of grape waste per year ending up on our property’s compost area. My main focus was to learn about improving our large-scale system. For years we dealt with composting our pomace (grape waste) this way: stockpile the skin, seed and stem waste on a corner of our property. Do nothing. Repeat every year. After about 4 years spread it out on weak corners of our vineyard to “add organics” to the soil. In hindsight we had good intentions but what we were doing was not really composting, it was called waste diversion. We believed we were doing something real–at least all those tonnes and tonnes of organic matter was not going to landfill (as it does with some wineries). The problem was, the waste (as I will call it now, not compost) was not really adding anything back to our vineyard. The nitrogen had leached out, the organics were non-existent, there was some biomass going onto the vineyard rows, a bit of a build up of the soil, but in no way replenishing any of the nutrients that we had taken out during the previous growing season. 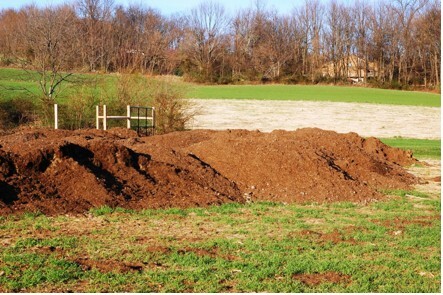 I now know that the technical term for our pomace mounds was static compost piles. If you drive around the Okanagan Valley and wine areas all over the world you’ll see them (or smell them, depending on the time of year). If you wait a year and do nothing the volume of the pile will decrease by about 40%, so not a bad thing–but not a great thing either. Every year that we take grapes off our estate property we are removing nutrients from our land as well. 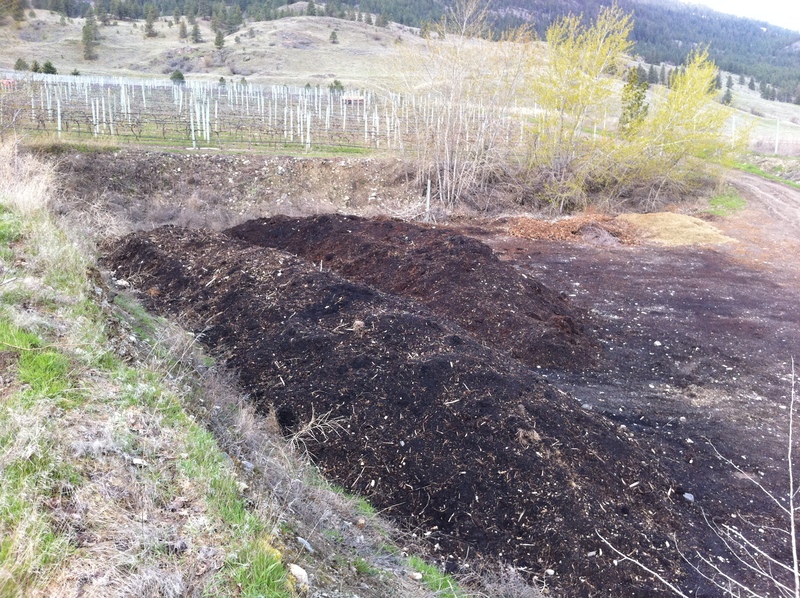 Our goal lately with our pomace was to be able to add back compost of value to our land. We now have a slightly more active system with our organic waste called turned windrow composting. The piles are shaped into longer and narrower piles that are turned more frequently to add aeration. To these piles of grape waste or “green” waste (a term in composting denoting organics high in nitrogen content) we now mix in “brown” waste (organic material with a high amount of carbon). In our case we have a huge amount of landscaping waste, vines that have been chipped, leaves and prunings–a ready available amount of brown waste. The mixture of the two Carbon:Nitrogen, the periodic aeration and also watering of the piles to keep moisture higher (around 55-65%) now gives us something that has nutrients when it goes back to the weaker areas of the vineyard. Something more than just waste diversion. In the next few weeks I am working on a much more intensive and faster system of compost that will handle the organic waste from Miradoro Restaurant. 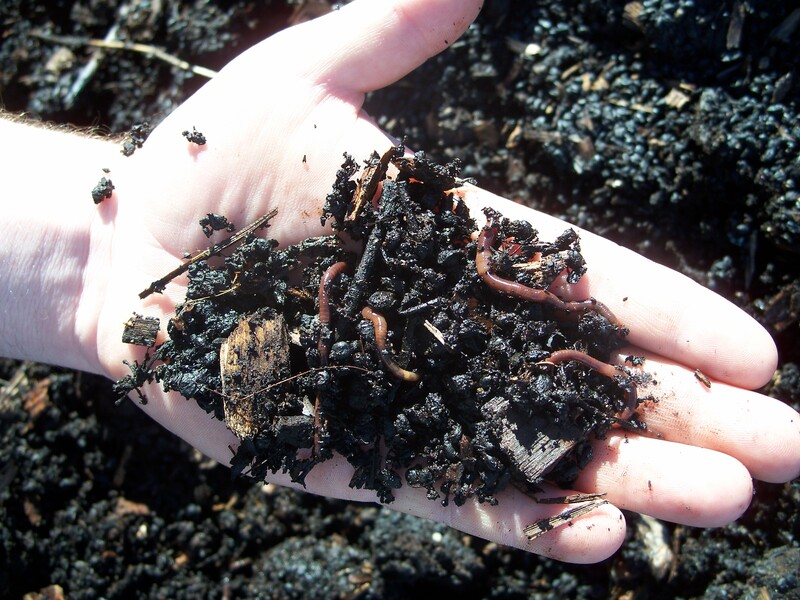 My end goal is to design a system of composting for the new restaurant that dovetails nicely into our winery compost system and can benefit the nutrition of our gardens and vineyard even more. The initial design includes pickling the food waste with a system called Bokashi (more in future posts) and then either adding it to our windrow system already in place or burying it directly in our vineyard or landscaping. There are many factors to take into account: time for handling, capital equipment required, ease of use, bear and other pest attractants, odours and the eventual composition of what is going back into our land–not to mention the tiny problem that none of this was on my to-do list this Spring! I will post again once we have started the implementation phase and look forward to any and all comments from you in the meantime. This entry was posted in Eco Sustainability and tagged bokashi, compost, pomace, restaurant, waste, wind-row. Bookmark the permalink.